Thanks to Paleo Diet and Fitness - one of our #YHLbloggers - we have another Your Healthy Living inspired recipe for you try. 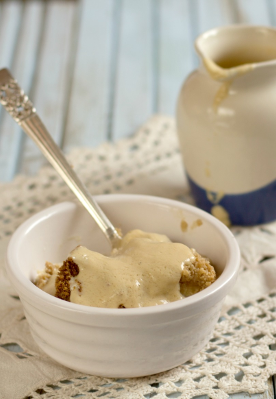 This delicious Paleo custard goes perfectly with a fruit crumble for a divine winter evening treat. 1. In a small saucepan, over a low heat, warm the milk gently with the split vanilla pod. 2. Bring it to the boil and remove the pod. 3. Use a small knife to gently scrape the seeds from the inside of the pod. Add these back to the pan. 4. Beat the egg yolks with the sugar and flour. 5. Add a little of the boiled milk to the egg mixture and briskly whisk back into the pan. 6. Whisk gently over a medium heat until the mixture thickens and starts to cling to the whisk. 7. Proper custard is thinner than the stuff we have become used to so don't try to recreate that. 8. You can pour and serve now, or press a piece of cling film onto the surface to stop a skin forming and reheat gently later.